The house reef at Gulen Dive Resort is home to a staggering 73 species of nudibranchs – all found in one and the same place. No other place in Norway has more nudibranchs than we do! And who said it was better in the tropics? The number of species has been confirmed by the scientists who take part in the annual Nudibranch Safari which is held every year. Nudibranchs can be found sometimes in the thousands. The sandy areas of the house reef are home to several species of rare gobies, and clingfish and snailfish are hiding under rocks and seashells. Larger predators like cod, hake and pollock are very common, and wolffish and monkfish may be seen at certain times of the year. The crustaceans are the biggest animal group found in the oceans. From microscopic plankton to huge lobster and spider crab they can be found in almost any habitat. the house reef has an exceptional diversity of crustaceans –, especially in the autumn. You can expect to see lobster, stone crabs, swimming crabs, camouflage shrimp, cleaner shrimp, sea spiders, barnacles, decorator crabs, squat lobsters and many other varieties. Many crustaceans are active at night, so donning your gear a little later in the evening leaves you the best chance to observe them up close and personal. This is a site for World class macro life and photography so bring your camera. 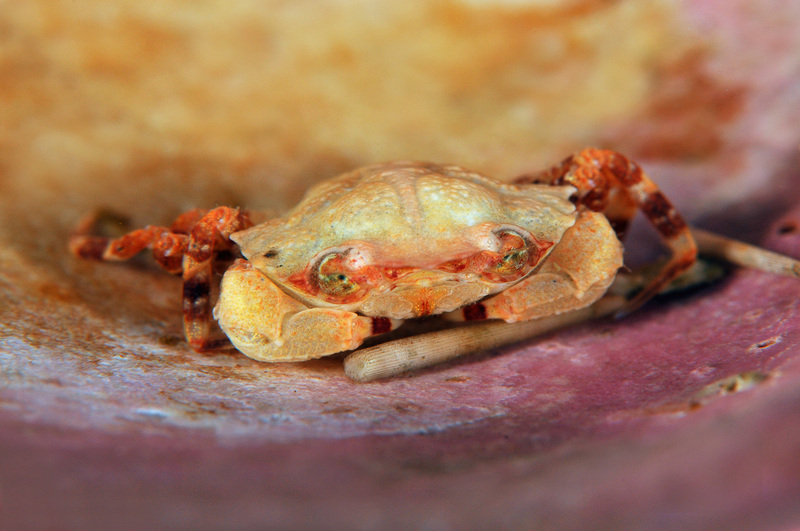 Small swimming crabs are very common at the house reef of Gulen Dive Resort. They typically hide between small rocks and underneath empty seashells. If you have a keen eye and take your time, your bound to find lots of these cute little fellows. and brittle stars, and even some sea cucumbers. We’re especially proud of all the beautiful feather stars found on the house reef. These graceful filter feeders are usually found at 40+ meters, but at the house reef, we have plenty of them in just 15-25 meters depth. Sometimes they perch camera-friendly on the kelp stalks, and they may even have small squat lobsters or other crustaceans hiding at the base. Anemones come in many shapes and sizes. They often have brilliant colours and come in a wide variety of patterns. We find anemones from the surface all the way to the bottom of our deepest dives. Some of them are petite and wax-white in colour, others huge and bright pink – or anything in-between. Beneath some anemones, you can be lucky and find whole families of tiny, bright red shrimp. Other may offer its stinging protection to a stone crab that has just moulted.